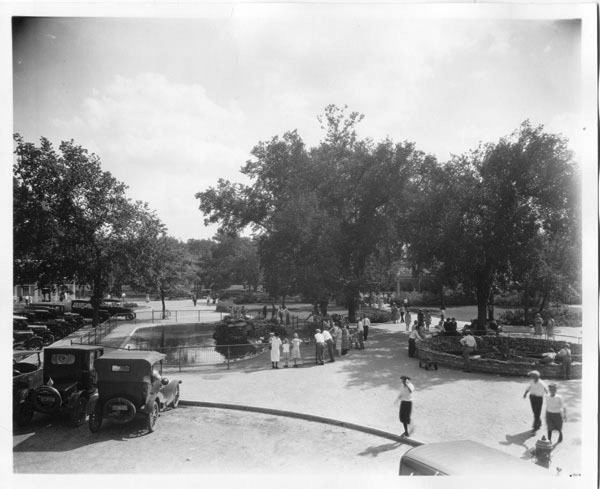 Keywords: Wichita, parks, arts and entertainment, sports and recreation, Riverside Park, Park Villa, lily ponds, picnics. 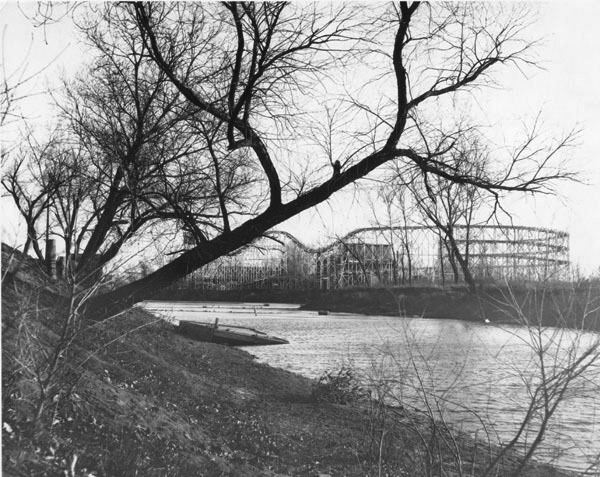 Keywords: Wichita, parks, arts and entertainment, rivers, Ackerman's Island, Arkansas River, roller coasters, amusement parks. 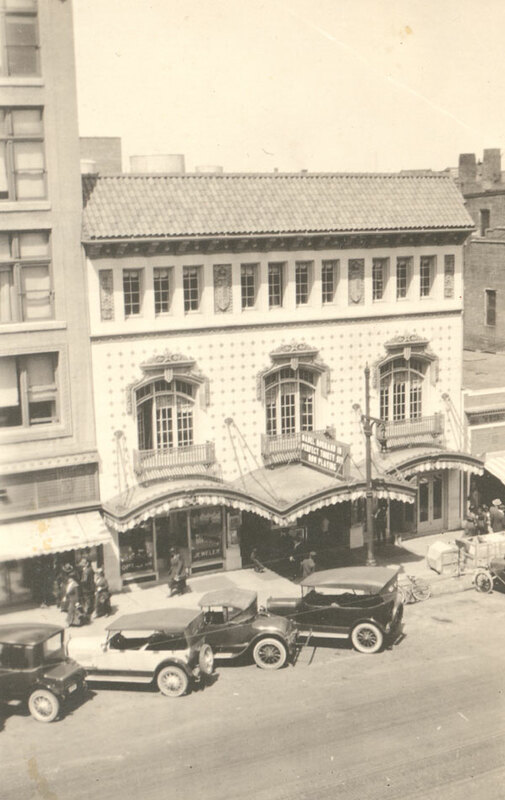 Description: Wichita Theater, located at 310 East Douglas. Keywords: Arts and entertainment, automobiles. 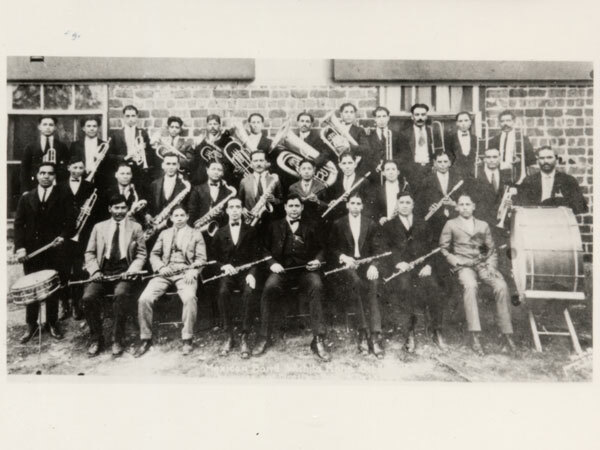 Description: Thirty-one unidentified men posed with band instruments. 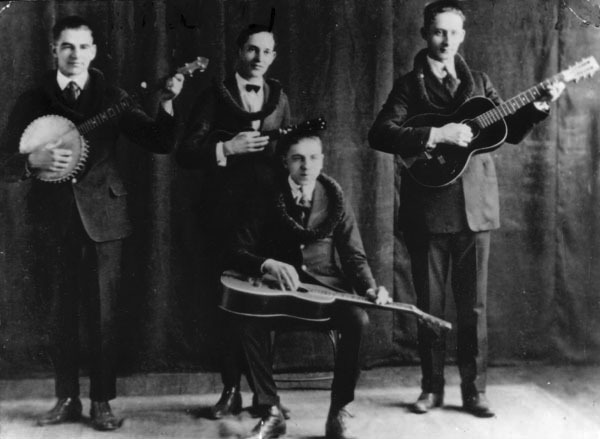 Notes written on photograph include: "Mexican Band, Wichita, Ks...Organizer and Director, Prof. A. De La Mara." 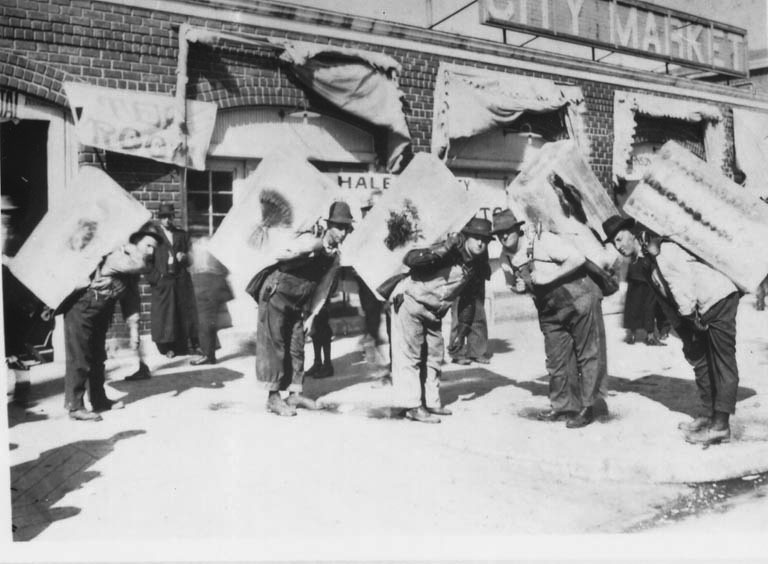 Keywords: Wichita; arts and entertainment; organizations, clubs and groups; people; immigrants. 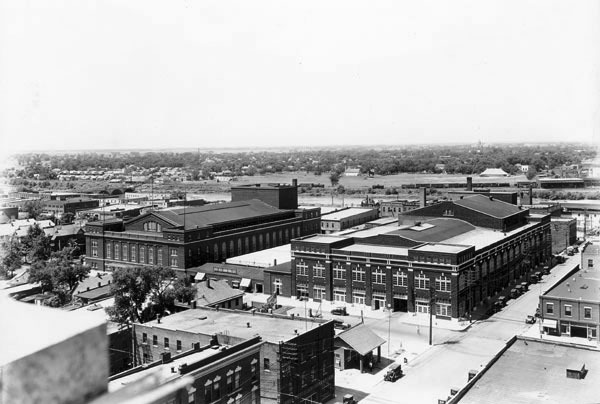 Description: Birdseye view looking southwest at the Forum Complex, 200 block South Water. The Murray Bridge is under construction on Lewis Street. Keywords: Aerials, sports and recreation, arts and entertainment, bridges, automobiles. 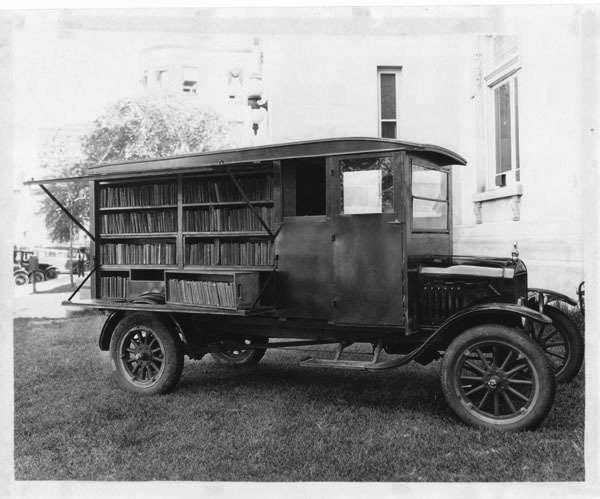 Description: Wichita City Library Bookmobile parked on lawn in front of old Carnegie library. Keywords: Wichita, libraries and museums, education, public services, transportation, arts and entertainment, public library, bookmobile, books. 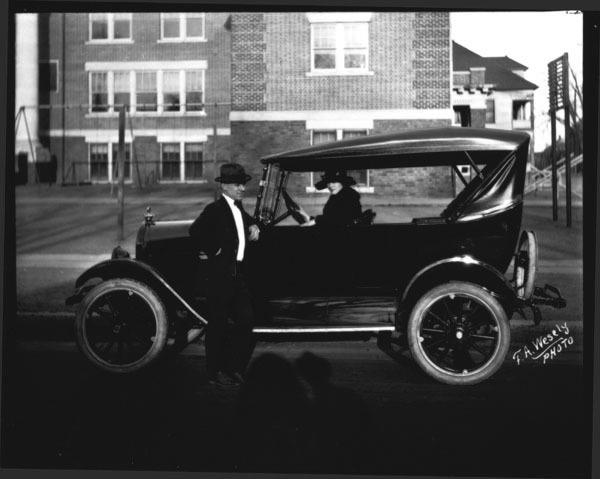 Description: Man and woman posed with a Star automobile. 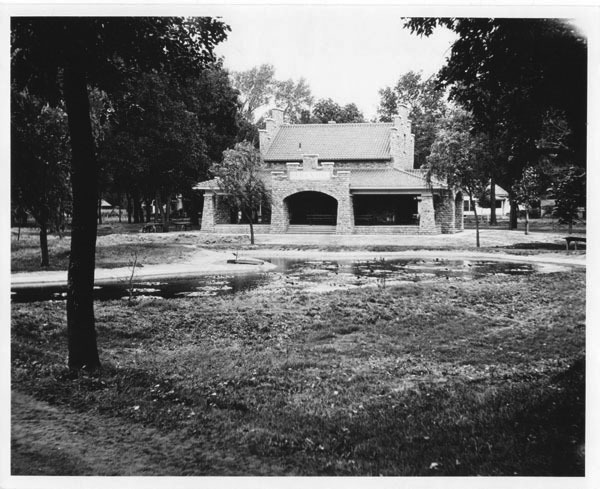 Location, Carleton School, 428 South Lawrence Avenue. Note the photographer’s shadow discreetly positioned in the foreground. Keywords: Arts and entertainment, business and industry, education, people, street scenes, fashion, photography, transportation, Wichita. Description: Group leader Gage Brewer (seated) in the early years of his career as a musician, songwriter, and dance orchestra leader. His group began performing on radio in Wichita, then traveled in and out of the U.S., and ultimately Brewer established the Shadowlands Dance Club in Wichita in 1937. Keywords: Arts and entertainment, business and industry, public events, guitars, banjos. Keywords: Wichita, parks, arts and entertainment, sports and recreation, people, Riverside Park, zoos, animals.